MOSCOW, February 15. /TASS/. Ukrainian President Pyotr Poroshenko has almost zero chances of winning the presidential election in Ukraine, so vote rigging is his only option to stay in power, Russian Security Council Secretary Nikolai Patrushev said in an interview with the Komsomolskaya Pravda daily. "As surveys show, Poroshenko does not have sufficient electoral support. His chances of a legitimate re-election are almost at zero. Ukrainians do not believe that the incumbent president and his inner circle have the ability to overcome the profound political and economic crisis in the country," Patrushev said. "Poroshenko’s only hope is the widespread use of falsifications and dirty political technologies." He said that Ukrainians themselves have long been aware that the upcoming elections will be neither free nor fair. 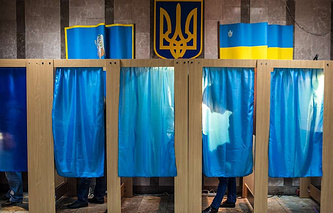 "Relevant governmental agencies of Ukraine have already received and keep receiving hundreds of complaints about violations registered during the electoral campaign, cases of illegal campaigning and vote-buying have already been reported," he said. "Re-election of Poroshenko will deepen the rift in the society and Ukraine itself," the Russian security official continued. "The incumbent government has already deliberately deprived of the right to vote millions of Ukrainians living in our country, together with residents of [self-proclaimed republics] of DPR and LPR, whom Kiev, by the way, still considers to be citizens of Ukraine. Therefore, favorable conditions have been created for vote rigging that will produce the desired outcome for Poroshenko." He said that Ukraine’s refusal to issue accreditation to Russian observers, including from the OSCE Office for Democratic Institutions and Human Rights (ODIHR), should be viewed as part of this process, because Russian observers "will never turn a blind eye to vote rigging, unlike Western representatives." Patrushev went on to say that Poroshenko blindly follows instructions from the United States and the European Union, so the West is eager to see him re-elected. "The West is not interested in the fact that during the four years of his presidency, a vast part of Ukraine’s population has become impoverished, while millions of citizens left the country in search for a better life," he said, adding that the incumbent Kiev government has made little progress in settling the civil conflict in the east of the country. "For the sake of keeping the incumbent anti-Russian government in power, the West has been deliberately turning a blind eye to the surge of neo-Nazism in Ukraine, which has literally became a state-supported ideology," Patrushev said. He compared the situation to years that preceded the World War II, when "Western politicians refused to notice the surge of Nazism after World War I." "Many industrialists, primarily from the United States, saw the Nazis as their partners in business. Regretfully, the West is reluctant to draw conclusions from the past," Patrushev said.